Id like you to meet Luca, Hes the new 'man' in my life! Whether you are heading to the office, or exploring the 4 corners of the globe, The Luca is the perfect companion for every occasion. 3 separate compartments, one with padded lap-top pocket, insulated water-bottle holder, clips for keys and phone/pen holders. The Luca is the perfect for a day out, allowing you to have your hands free, and with the padded straps and back panel makes for extra comfy ride. Oh I love it! The bag (like all of thier bags are soooo well made and really funtional. There are pockets and pouches for everything you would need, its really spacious and stylish and best of all Sparatacus will use it, so I've now doubled our carry on capacity for air travel. Previous to this he has refused all carry on luggage! But he actually said 'aye its alright' if you are a regular visitor you will know this is high praise indeed from my Spartacus! There are 2 external bottle pockets and a huge front zip pocket, internally theres an insulated bottle pocket, key hook, 2 pen pockets and another pocket big enough for a mobile phone or wallet, then across the back internally is a completely cushioned section big enough for a lap top. There's also an airline friendly clear plastic pouch for toiletries or to use as a wet bag, a carry handle on the top of the bag and really comfortable adjustable rucksack straps. Now I could show you a picture of the bag with all of our travel essentials in or packed for a day out with three kids in order to demonstarate how roomy and amazing it is. But I thought this was a much better vsualisation! 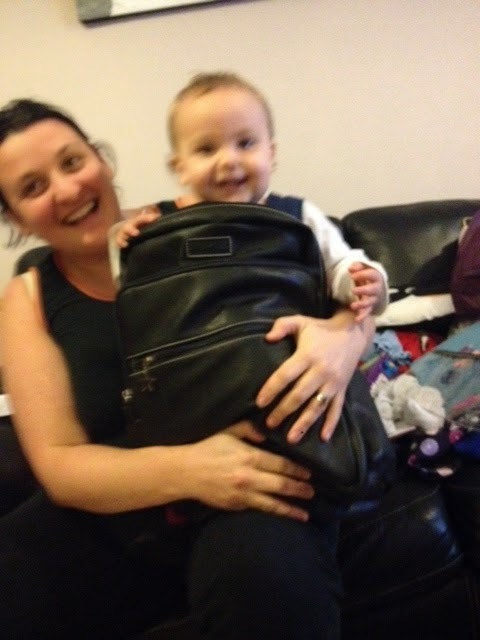 Please note neither I nor Mia Tui advise, recommend or endorse putting your children in a bag of any kind, and no children were harmed in the staging of this picture!!!!! The gorgeous people at Mia Tui have said they will offer my readers a fabulous 30% off the Luca if you use code LUCA30 when ordering, and they've also ofered me a Luca to give away, you know the drill fill in the form and we will draw a winner from the correct entires...GO! I like the Olivia tan bag! Luca seems pretty cool. I love that you can use it as a laptop bag on an airplane. I love the Mini Amelie but this design looks great too. The colours in the range are lovely. Is this giveaway open to Canadians? If so, I'd love to enter to WIN. I love Ella, Olivia and Grace bags.I have two Lottie bags which I love. Would love to win the Luca! I really like the Olivia bag in tan! What a really smart bag! I've not had a MiaTui myself but I've heard lots of good things about them! haha look at her in the bag love that pic!! seems very roomy indeed! i think i would love a Grace! I love the lottie chocolate one. Fab prize.